The idea on the necessity of an institution, which would protect the Satversme (the Constitution), was first expressed by the Member of the Saeima Pauls Šīmanis in 1930 in his Article “Eight Years of the Constitution of Latvia”. On 8 May 1934, furthering the above idea, the Member of the Saeima Helmuts Štegmanis submitted a motion to supplement the Constitution with Article 86.1, which envisaged establishment of a special State Court. However, this motion did not receive the required majority of votes. At the time, when the independent and democratic State of Latvia was restored, the necessity of the Constitutional Court was not questioned. It was mentioned also in the Declaration of 4 May 1990 “On the Restoration of Independence of the Republic of Latvia”, adopted by the Supreme Council. However, the Law “On Judicial Power” – adopted on 15 December 1992 – stated that a Constitutional Supervision Chamber within the body of the Supreme Court of the Republic of Latvia and not a special institution should be established. It was never done. 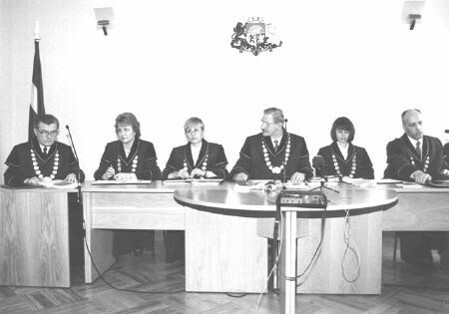 In 1993, after the Fifth Saeima commenced its activities, the government started elaborating the Draft Law on the Constitutional Court and in spring of 1994 submitted it to the Saeima. In June of 1994 the Saeima passed the Amendments to the Law “On Judicial Power”, providing for the establishment of an independent Constitutional Court, the activities of which would be regulated by the Constitutional Court Law. On 5 June 1994 the above Law, together with certain Amendments to Article 85 of the Constitution of the Republic of Latvia, was adopted. In accordance with it the Constitutional Court is an independent institution of judicial power, which within the jurisdiction set forth in the Constitution of the Republic of Latvia and the Constitutional Court Law, shall review cases concerning the compliance of laws and other legal norms with the Constitution, as well as other cases placed under its jurisdiction by law. 9 December 1996 can be considered to be the birthday of the Constitutional Court, when those four of the confirmed justices of the Constitutional Court, who had not worked as judges before, swore the oath of the justice. In October and November 1996 the Saeima confirmed into office six of seven Justices of the Constitutional Court: Romāns Apsītis and Anita Ušacka – upon the proposal of the members of the Saeima, Ilma Čepāne and Aivars Endziņš – upon the proposal by the Cabinet of Ministers, and Andrejs Lepsis and Ilze Skultāne – upon the proposal by the Plenary Session of the Supreme Court. On 8 June 2000 the Justice Juris Jelāgins gave the oath. On 6 February 2004 Justice Gunārs Kūtris gave the oath, he replaced Anita Ušacka, who, as the representative of Latvia was elected to the office of a Judge at the International Criminal Court. Whereas on 25 March 2004 Aija Branta assumed the duties of the office of a Constitutional Court Justice. She was elected into the office of a Justice to replace Ilze Skultāne, who currently is a Senator at the Department of Administrative Cases of the Supreme Court Senate. On 3 July 2006 Ilma Čepāne announced that she was leaving the office of a Justice. Her term of office expired on 11 July 2006. On 4 January 2007 the term of office expired for Justice Andrejs Lepse, and on 5 January 2007 he was replaced by Uldis Ķinis. The term of office of the President of the Constitutional Court Aivars Endziņš expired on 31 January 2007. On the same day the oath of the Justice was given by Justices Viktors Skudra and Kaspars Balodis. Justice Romāns Apsītis left office on 28 February 2007. On 23 May 2007 the oath of the Justice was given by Justice Kristīne Krūma. On 22 June 2010 the term of office of Justice Juris Jelāgins expired, and on 28 June 2010 he was replaced by Justice Vineta Muižniece. In May 2011 Justice Viktors Skudra passed away. He was replaced by Justice Sanita Osipova, who came into the office of a Justice on 17 August 2011. In February 2014 Gunārs Kūtris’ term of office expired; he was replaced by Gunārs Kusiņš, who came into the office of the Constitutional Court Justice on 19 February 2014. On 24 April the term of office expired for Justice Aija Branta, on 25 April 2014 she was replaced in office by Aldis Laviņš. Vineta Muižniece left office on 19 June 2014. Ineta Ziemele was confirmed into the office of a Justice to replace her, and Ineta Ziemele came into office on 8 January 2015. On 10 October 2015 Kristīne Krūma left office, Daiga Rezevska was confirmed into the office of a Justice to replace her. The term in office of the Justices of the Constitutional Court Uldis Ķinis and Kaspars Balodis expired on 31 March 2017. On 22 December 2016, they were replaced by Jānis Neimanis and Artūrs Kučs, who were approved as the Justices of the Constitutional Court on 22 December 2016. Jānis Neimanis entered office on 3 April 2017, whereas Artūrs Kučs entered office on 21 April 2017. Since the establishment of the Court until January 2007 the Constitutional Court was headed by Aivars Endziņš, Gunārs Kūtris continued this work until February 2014, but in the period from 28 February to 24 April this was done by Aija Branta. From 6 May 2014 until 8 May 2017 Aldis Laviņš served as the President of the Constitutional Court. On 8 May 2017 Ineta Ziemele was elected President of the Constitutional Court. Uldis Ķinis served as the Vice-president of the Constitutional Court until 31 March 2017, when his mandate of the Justice of the Constitutional Court expired. On 16 May 2017, Sanita Osipova was elected Vice-president of the Constitutional Court.